For the last few fashion seasons Reward Style has celebrated the momentous journeys of fashion bloggers by hosting a grandiose party in the heart of NYC and this season was no exception. The likes of many pretty faces and fabulous styles walked the rooftop of Empire hotel. The fashion was undeniably top tier as every blogger showed her best attributes to mingle with her camaraderie. It was a spectacular moment to be among ladies of fashion blogging. 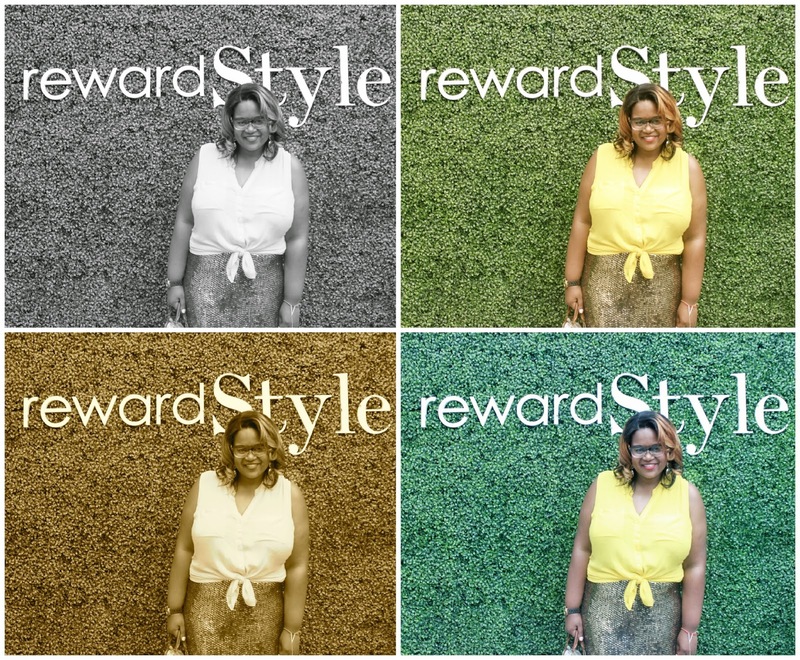 Reward Style is a wonderful organization that rewards fashion bloggers monetary compensation for the fabulous fashion they share on their blogs and social media. It's a win win for both the blogger and viewer as the blogger shares her favorites and the viewer is able to purchase right on the spot. Undeniably the best part for me was being able to get reacquainted with ladies that I met when I started this journey. Pictured above are Elle from Ripped Nylon, Aminta from Clothes and Fashion, and below Trisha from Fashion According To The Menu whom I met at my first IFB conference. It was so good to see their gorgeous faces. Being among the crowds of fashionistas at this event it wasn't too hard not to notice all the gorgeous styles and trends. One particular trend I took note of was the impact of a fantastic skirt. From my glitter skirt (which I wore because it was just the sparkle I needed for the day) to Aminta's sheer A-line number and to the ladies below with the genius idea of pairing 2 skirts to make an ensemble skirt to gorgeous gatherings of printed material that looked so sleek. My eyes were in fashion heaven! Being the vintage lover that I am I wore a vintage gold sequin pencil skirt with a pop color top and easy gold tip heels. It was a great event to be included in. The fashion was amazing to say the least. I so look forward to next season's extravaganza. You look fabulous dear and the dress you choose for the party made the perfect party pick. Thank you so much for sharing it here. This week I am also going to attend the party at SF event venues and will consider wearing a dress like you.